In this latest batch of game developers doing remarkable fake gamer poses, we show intensity, more Suda 51, and what happens when things bovine go corporate. 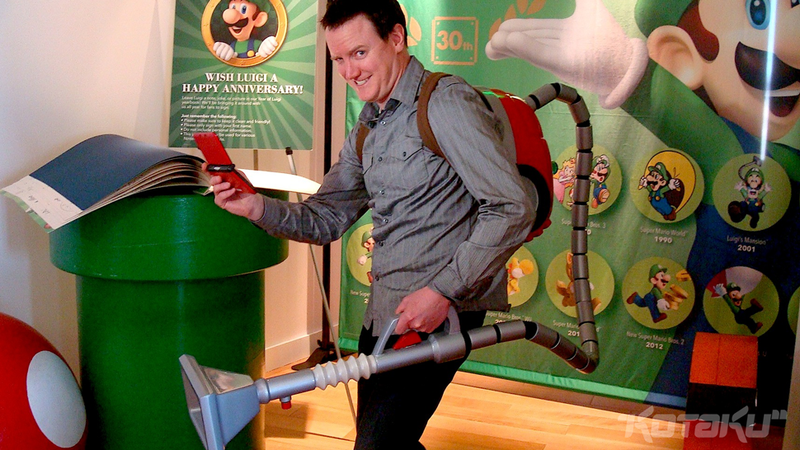 For a brief minute, Nintendo’s Bill Trinen (above) was corrupt with power. It’s the risk you take when you have wearable appliances (and a photographer) at a media event. Grasshopper Manufacture’s Akira Yamaoka has a pic of me taking a picture of him on his iPhone. Or he might’ve deleted it. Bioware’s Neil Thompson (though this pic was taken when he was promoting James Bond 007: Blood Stone). Capcom’s Shu Takumi goes through one DS per week. This is Julie, the scanned model of the rebooted Reiko Nagase in Ridge Racer 3D. This is Rich, producer on Dead Space 2. He turns necro at the beginning of the game. Tenured stock photo model instructors Kazuhiro Tsuchiya of Capcom (left) and CyberConnect2’s Hiroshi Matsuyama show what a controller might look like. Beenox’s Dee Brown and Mercury Steam’s David Cox compete for most relaxed developer. The only thing better than a gamer stock photo is a corporate stock photo. Here’s Natsume CEO Hiro Maekawa. He’s the one pointing. Voice actor Tom Gottlieb is known for his role as Cookie Masterson on You Don’t Know Jack. He not a fan of pictures, but allowed us this rare photo opp. Diablo co-creator David Brevik shows fake gamers how it’s done, with a world eater to cheer him on. Fun fact: Ubisoft Toronto’s Maxime Beland initially posed like Hideo Baba, but he deleted the photo. The seducer, Jenova Chen, previously of thatgamecompany. Capcom’s Yoshinori Ono (and his feet) show how to call permanent dibs on a controller. Tango Gameworks’ Shinji Mikami and Eidos Montreal’s Jean Francois Dugas. Only in a back alley could Ubisoft Montreal’s Dean Evans reveal the chopper edition version of Far Cry 3: Blood Dragon. Because you enjoyed the previous pic of Guerilla Games’ Herman Hulst, here’s another angle. Miguel is a video producer and writer, currently freelancing with Rev3Games, Machinima, OXM, MTV Multiplayer, GamesRadar as well as several foreign news outlets. He can be followed on Twitter at @NormalMode. All photo credit in this post is his.